Auckland Aces 4-136 (Martin Guptill 40, Anaru Kitchen 33*, Sarfraz Ahmed 2-31) beat Sialkot Stallions 9-130 (Shahid Yousuf 39, Ali Khan 19, Kyle Mills 2-6) by six wickets. Auckland Aces displayed a solid team work in all departments of the game and defeated Silakot Stallions in the qualifying match of the Champions League Twenty20. Sialkot Stallions managed 130 runs with just one wicket remaining at the closure of the scheduled 20 overs and Auckland Aces hammered 136 runs for the loss of four wickets and 17 balls to spare. Kyle Mills (Auckland Aces) was declared ‘Player of the match’ for his excellent bowling spell of 4-1-6-2 wickets. The 1st qualifying match in Pool 1, of the Champions League Twenty20 was held at New Wanderers Stadium, Johannesburg, on Tuesday, October 9, 2012. Shoaib Malik, the captain of Sialkot Stallions won the toss, decided to bat and lost an early wicket for just two runs. Haris Sohail got together with the opener Imran Nazir who hit the first six of the innings in the fourth over and the score crawled to 11 in the initial five overs. Azhar Mahmoud was introduced in the bowling attack by the Auckland Aces skipper, Martin Guptill in the 6th over. Azhar received a harsh treatment as both batsmen added 18 runs with a couple of sixes and one four in that particular over. The score reached 30 in 6.3 overs as Haris Sohail was gone for 12 runs and Imran Nazir was caught and bowled by Azhar Mahmoud on the second ball of the next over for 17 without any addition to the total. Shoaib Malik and Shahid Yousuf associated in the park as the latter was the more impressive of the two. Shahid Yousuf hit two successive sixes in the 9th over and another two fours in the following over. The duo accumulated 57 runs to the score which was enhanced to 87 in 14 overs. Shahid Yousuf was caught and bowled by Ronnie Hira for 39 off just 25 balls with 3 lofty sixes and even fours. Shoaib Malik became the next victim after scoring 19 and adding seven runs to the total. The lower order batting was unable to face the lethal bowling of the rival team and reached 130 for the loss of nine wickets when the last ball of the 20th over was bowled. Kyle Mills, Andre Adams and Ronnie Hira shared the honours of holding two wickets each whereas Michael Bates and Azhar Mahmoud got one wicket each. Auckland Aces gave a solid reply as Martin Guptill and Lou Vincent gathered 10 runs in two overs. They punished Sarfraz Ahmed for 18 runs in the third over with 3 back to back fours by the latter batsman. The score was taken to 32 in 3.4 overs as Vincent was gone for 20 off 16 with 1 six and 3 fours. Azhar Mahmoud walked in the centre next and got two fours in the sixth over as Guptill carried on consolidating at the other end. Guptill hit 1 six and 2 fours in the 8th and 9th over but was finally caught at deep square leg by Bilawal Bhatti off Naved Ul Hasan for 40 off just 32 balls with 1 six and 5 fours. The second wicket fell at 83 in 10.2 overs when Sarfraz Ahmed struck twice in the 14th over by removing Azhar Mahmoud for 24 and Colin de Grandhomme for a duck. 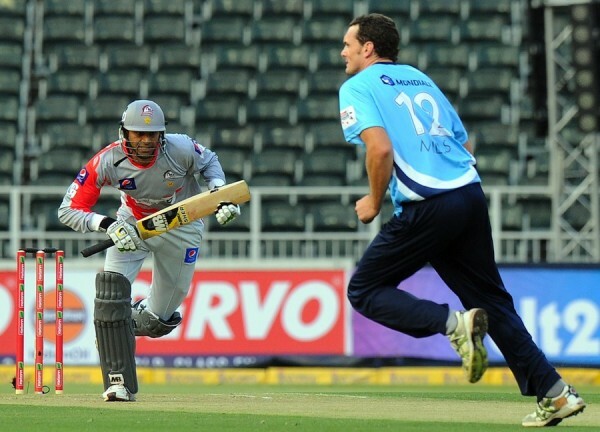 Auckland Aces were four wickets down for 97 in 14 overs when Anaru Kitchen and Colin Munro took over the charge. Kitchen was more severe on the rival bowlers and sent the ball out of the rope at regular intervals. The runs started showering from the blades of the two batsmen and Kitchen dispatched the winning six on the first ball of the 18th over. He remained unbeaten for 33 off 21 mere deliveries with 2 sixes and even fours and Munro was at the other end at 13 as Auckland Aces thrashed 136 runs with six wickets in hand in 17.1 overs. Sarfraz Ahmed was the best bowler with two wickets whereas Bilawal Bhatti and Naveed-Ul-Hasan shared one wicket each. Auckland Aces grabbed the match easily with a huge margin of six wickets and got two solid points.